A solid and attractive update that's light on pointless 'whizz bang' additions. ...but the parameters are odd. Wave Meters could be more functional. Still no mixer undo! 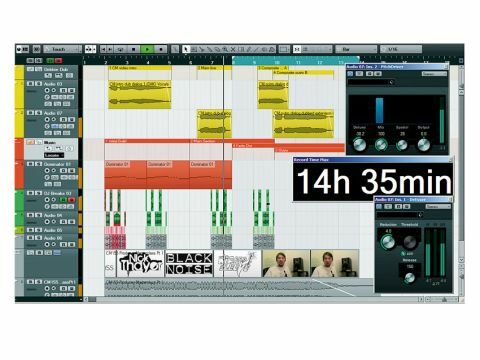 Nuendo weighs in at nearly three times the price of its little brother Cubase. Wave meters in action! They look pretty cool but we'd like to see Steinberg take the concept further. The Passes panel and Trim mode. Whereas Cubase has long been a staple product for computer musicians, those working in post-production for film, TV and radio are more likely to turn to its sibling, Nuendo. The two apps are superficially similar, but each has its own exclusive features. Post-production is where music, sound effects, actors' dialogue, etc, are compiled into a finished stream of audio in a specific format - it might be in surround sound, too. "Surround Panner v5 makes the previous effort look chunky." This is where Nuendo steps in, with features such as extensive surround support (up to 12 speakers), pro video and sync functionality, import/export of a wider range of formats, and network collaboration. Traditionally, certain features in Nuendo have filtered through to Cubase (and vice versa), and in fact, there are a few things in Nuendo 5 that are also in the recent free Cubase 5.5 update. Of course, here we'll focus on the musical side of Nuendo 5. The Cubase/Nuendo MediaBay is something that, until now, hasn't really clicked with us. The idea is that you use it to index all the relevant data (audio, MIDI, projects, plug-in presets, etc) on your drives, so that you can browse, filter and preview it all at your leisure. It's been overhauled for Nuendo 5 (and Cubase 5.5) and we're pleased to say, it's really making more sense now. The layout has been refined and it just seems more logical and friendly, not to mention swifter overall, making it something we actually want to use. You need to tag all your data for it to be of much use, but that chore could well be worth the effort for post-production houses. Also new are Clip Packages, whereby you select a bunch of related audio clips and export them - you can later pull them from the MediaBay to recreate the original structure of clips. Many music producers create beats with samples on audio tracks, and we found Clip Packages to be a great way of stashing away such 'composite beats' for later use. New in the mixer is the Wave Meters view, which shows a visual recreation of the clips on the audio tracks scrolling upwards. It doesn't show the channel's output data, though, and while that does mean you can see what's coming up in advance, it still feels like an underdeveloped idea - you can't adjust the speed or scrub by dragging, for instance. Next up is Direct Routing, enabling you to designate eight possible output destinations for each channel, and then flick between them with a single click. You can switch multiple channels at once, and even select multiple destinations, and it's all automatable. It works nicely (aside from a momentary level increase during the change), though you can't set a level offset for each output. Note that you can now arm multiple channels for recording too. There's a new pitchshifter plug-in, Pitch Driver, with a claimed range of "up to 24 semitones", but while you can go two octaves down, it seems you can only pitch up by one. And the Detune parameter isn't in semitones - it's an arbitrary scale ranging from -98 to 98. Since it stops shy of -100/100, it's always a bit out of tune at its extremities. All of which is a shame because it sounds bloody good! On vocals, you can get a natural-sounding shift with sensible values, or push it right down for creepy, 'slowed down tape' effects. We tried it on synths, too, and there are some impressive thickening choruses to be had, as well as deep sub-bass reinforcements. It even sounds cool on drums. Elsewhere, you've got in-depth data tagging of markers, which is intended to facilitate spotting (ie, marking) of actors' dialogue that needs to be dubbed (eg, due to being recorded in a noisy location). The slick Surround Panner v5 makes the previous effort look clunky, with crafty features like rotation and width/depth adjustment. The new QuickTime-based video engine offers improved performance and more functionality, and there's multi-mono file support (for Pro Tools compatibility). There's also a new De-Esser plug-in that gives natural results with no fuss - it's simple but effective. There are a bunch of new features from Cubase 5, the biggest being the PitchCorrect (Auto-Tune-alike) and REVerence (convolution reverb) plug-ins, and Melodyne-esque VariAudio graphical pitch/timing editor. Nuendo's automation system has always been more sophisticated than Cubase's, and the new Passes system is a case in point. Let's say you record a complex automation curve using multiple passes, but you're not happy with the last few passes and want to hear how it sounded earlier. The Passes panel shows each pass as a separate entry, and you can 'back up' through them, for immediate comparison. The clever thing is that you can return to an earlier point, then record more passes, creating a new 'branch', shown in the right-hand area. You can do this as many times as you like, creating a tree representing your different efforts, then click on the nodes to flick through the various permutations until you find 'the one'. For anyone who records automation manually, this is pure gold. Note that Nuendo's main undo system also offers branches functionality. The enhanced Trim feature (which, unlike Passes, is in Cubase 5.5 too) is similarly superb. Click the Trim button and a secondary automation curve is layered over the primary one - you can shape it as normal, by recording or with the mouse, and it will influence the final shape, which is also depicted. You can now non-destructively create, say, a general level dip in the middle of a complex curve. Like Cubase 5.5, Nuendo 5's performance has been sharpened - it's snappier overall, with fewer dropouts when running complex projects at low latencies - and the interface has been touched up a bit. However, there's still no proper undo for mixer operations, and the 'window hell' of the Nuendo/Cubase interface doesn't seem to be going away any time soon. The timestretching algorithms are still only average, and while you can perform 'elastic audio'-style tricks, it's not handled as elegantly as in some other apps. Bugs-wise, the improved 32-bit-to-64-bit plug-in bridge didn't play nice with all of our plug-ins (although it seems better than before), and oddly, Nuendo seems to cause a tiny fade-in whenever you hit play - very odd! Steinberg has already issued one maintenance update during our review period, so here's hoping it keeps up the pace with the bug-crushing. Overall, Nuendo remains a post-production powerhouse with an epic price tag to match.